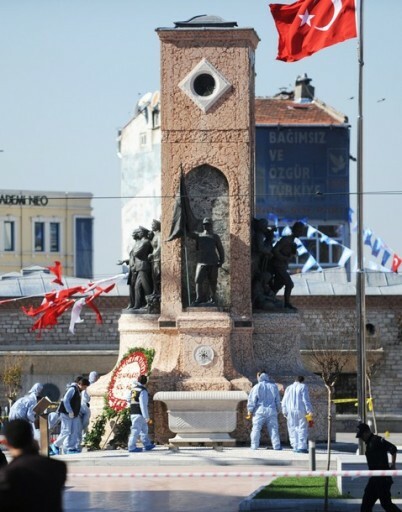 November 01, 2010 (KATAKAMI / Rantburg.com/ KUNA) — Turkish Prime minister Recep Tayyip Erdogan pledged to punish severely the perpetrators of the suicide kaboom which injured 32 people including 15 coppers at Taksim Square, central Istanbul, Sunday morning. “We’ll never tolerate those who threaten Turkey’s peace, security and development,” Erdogan, now on a visit to Mardin – a mainly Kurdish town southeast Turkey, said in a televised speech. “Such terrorist acts will never hinder Turkey’s quest for of peace, development and fraternity among all members of society,” he underscored. 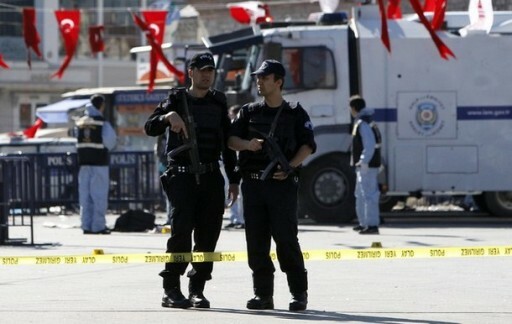 President Abdullah Gul said the attack targeted a group of coppers who have been mobilized for the national holidays such as the Republic’s Day celebrated on Friday. “The attackers will fail to obstruct the nation’s march towards friendship, peace, fraternity and development,” Gul said. 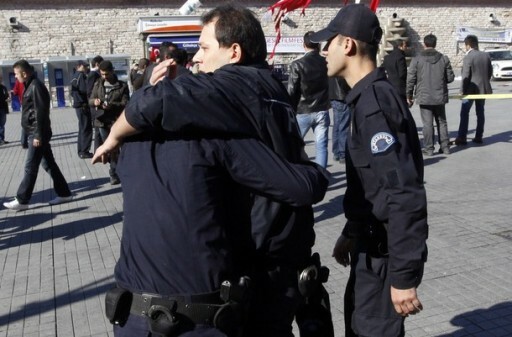 A woman wearing an boom belt struck close to a number of police buses which were parking near the statue of Mustafa Kemal Ataturk – the founder of modern Turkey, at Taksim Square. Though no group grabbed credit for the attack against Turkey’s business center, Turkish officials believe the attack bears the hallmarks of the separatist Kurdistan Workers Party (PKK) or Al-Qaeda since the two organizations targeted the city several times in the past. The attack took place two months ahead of expiry of the unilateral ceasefire announced previously by the PKK . 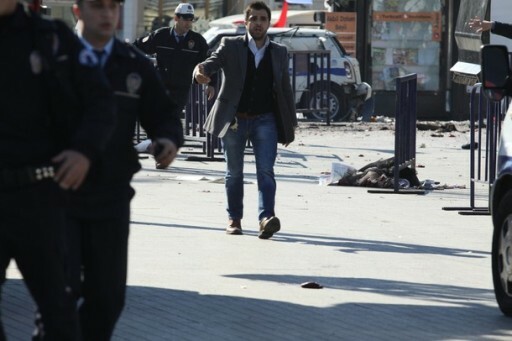 November 01, 2010 (KATAKAMI / Reuters) – A suicide bomber wounded 32 people in an attack targeting Turkish police in Istanbul’s main square on Sunday, an area teaming with tourists and shoppers. No organisation has claimed responsibility, officials said, though the city has been targeted in the past by Kurdish separatist militants and al Qaeda, as well as militants from Turkey’s far-left. 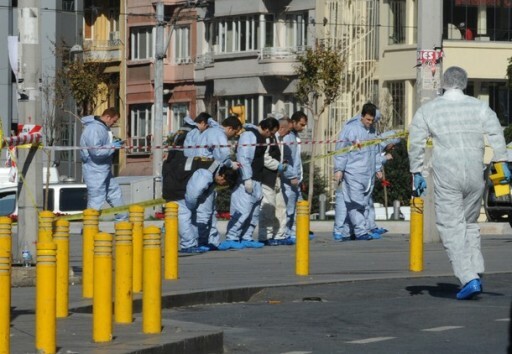 Istanbul police chief Huseyin Capkin said a man had approached police stationed at the square before blowing himself up. Television footage immediately after the explosion appeared to show police firing warning shots and people fleeing in panic. 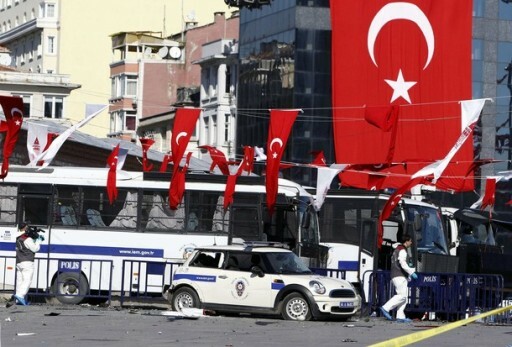 Fifteen policemen and 17 civilians were wounded in the attack at 10.40 a.m. in Taksim Square, but only nine, mostly police, were kept in hospital, Istanbul Governor Huseyin Avni Mutlu told reporters. Taksim Square is a tourist and transport hub surrounded by restaurants, shops and hotels, at the heart of modern Istanbul. The bomber struck near police buses parked close to a monument commemorating Mustafa Kemal Ataturk, the founder of modern Turkey, and victory in the war of independence in 1923. 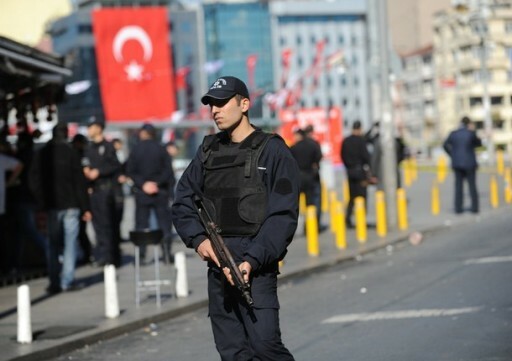 The police presence in Taksim is raised around national holidays like Republic Day, which was celebrated on Friday. Mobile phone footage taken just after the explosion showed a woman lying close to the monument bleeding heavily from her leg, and a policeman also lying with blood streaming from his head. 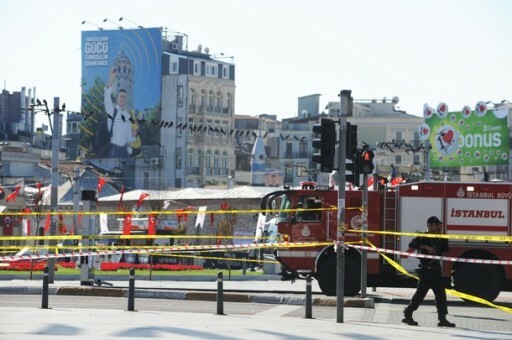 A taxi driver told CNN Turk news channel he saw a 30 to 33-year-old man approach the police to ask directions, at which point the bomb detonated. Another witness said he saw two men. According to the governor, police seized plastic explosives found with a detonator at the scene, though it was unclear whether they had been part of a second bomb. Prime Minister Tayyip Erdogan was visiting Mardin, in the mainly Kurdish southeast, when the blast struck his hometown. “Those who threaten Turkey’s peace, security and development will not be tolerated,” he said in a televised speech. Istanbul is the business and financial centre of Turkey, an overwhelmingly Muslim nation of 75 million people that is hoping to become a member of the European Union. The city has been targeted before by Kurdistan Workers Party (PKK) rebels, but the separatist group extended a unilateral ceasefire last month, and on Saturday said it would announce in the coming days whether it would extend it further. PKK suicide bombers have attacked security forces in the past, but not for many years. 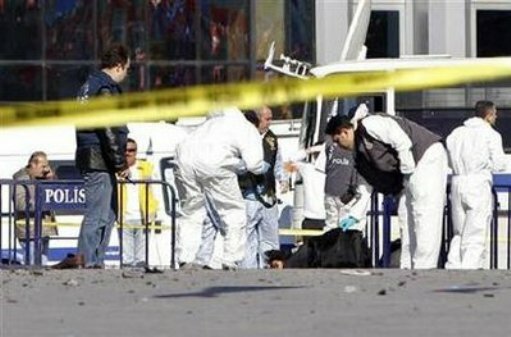 Al Qaeda suicide bombers carried out a series of attacks in Istanbul in November 2003 that killed 62 people and wounded hundreds. In recent weeks Turkish police have made several arrests of people suspected of providing support to al Qaeda militants fighting in Afghanistan. On Sunday, Anatolia newsagency reported police in Istanbul and other cities had detained 16 members of a leftist militant organisation, the Revolutionary People’s Liberation Party/Front (DHKP/C). 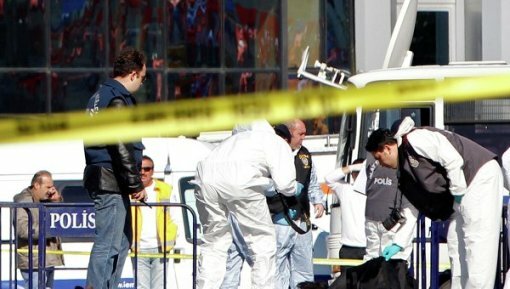 The report made no connection with the Istanbul attack, but in 2001 a DHKP/C suicide bomber killed two people in Taksim Square. 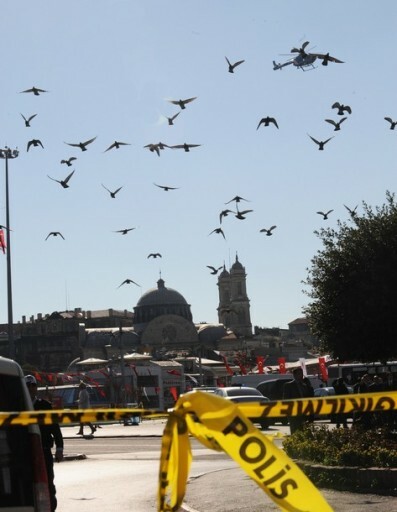 October 31, 2010 (KATAKAMI / VOA) — Turkish police say they are working to disable additional bombs found at the site of a suicide bombing in Istanbul. 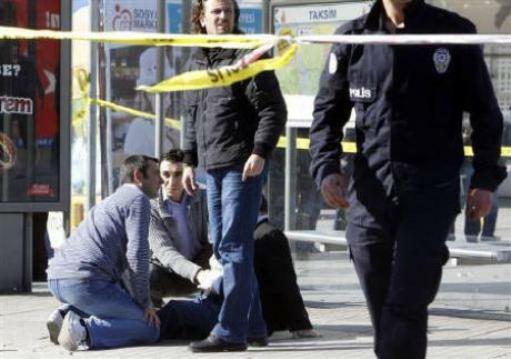 October31, 2010 (KATAKAMI / BLOOMBERG) — At least over 15 people were injured in a blast in central Istanbul that the city’s police chief said was caused by a suicide bomber. The attacker attempted to board a police minibus in Taksim Square in the Turkish city today, Huseyin Capkin told NTV television. Capkin said at least nine police and six others were injured, and said that two of the injured are in a serious condition. It wasn’t immediately clear who was responsible for the blast. Kurdish, leftist and Islamist groups have carried out attacks in the city in the past. A country-wide cease-fire imposed by the Kurdistan Workers’ Party, or PKK, was scheduled to expire today. A senior commander of the group, Murat Karayilan, apologized for killing civilians and said he wants to extend the cease-fire indefinitely, Radikal newspaper reported on Oct. 28. He also vowed not to harm civilians in future attacks, the newspaper cited him as saying in an interview. Turkey’s fight against the PKK, which seeks autonomy in the country’s largely Kurdish southeast and is considered a terrorist organization by the U.S. and European Union, has led to the deaths of some 40,000 people since 1984, most of them Kurdish civilians.